Tokyo, October 11, 2013 – Fuji Heavy Industries Ltd. (FHI), the manufacturer of Subaru automobiles, today announced that the Subaru Forester (US specifications model) was named MOTOR TREND's 2014 Sport/Utility of the Year. The Subaru Forester's victory follows the its previous model's win for the 2009 award and the Outback's win for the 2010 award, making Subaru the first and only automaker to win MOTOR TREND's Sport/Utility of the Year three times. 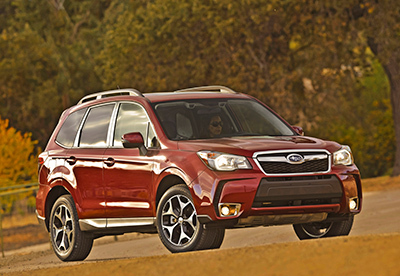 MOTOR TREND editor-in-chief Ed Loh, said, "The 2014 Subaru Forester beat a highly competitive field of SUVs because it best met our award's six key criteria. Smart design, thoughtful engineering, and a compelling performance on road and off were the keys to the Forester's win. Our editors were particularly impressed by the powerful yet efficient turbocharged engines, the intelligent and sporty CVT transmission, and the excellent visibility and interior package found within the Forester. Practical, affordable, efficient and fun-to-drive - Forester truly ticked every box". MOTOR TREND's Sport/Utility of the Year is only open to all-new or substantially upgraded vehicles that have gone on sale in the 12 months from November 1 of the previous year. To judge contenders for the award, MOTOR TREND's editorial staff conducted an exhaustive testing process. The judging criteria includes six categories; Design Advancement, Engineering Excellence, Intended Function, Efficiency, Safety and Value. The US spec Forester which went on sale in March 2013 was developed with the goal to maximize its value as a true SUV. Featuring Subaru's distinctive, renowned symmetrical All-Wheel Drive (AWD) system as its core technology, the fourth generation Forester boasts a higher level of driveability as well as enhanced safety and environmental performance combined with much improved capabilities as an SUV offering fun-to-use versatility and fun-to-travel driving performance. In May 2013, the Insurance Institute of Highway Safety (IIHS; a nonprofit organization supported by auto insurers in the US) awarded the best possible ranking of 2013 TOP SAFETY PICK + (TSP+) to the Forester currently sold in the North American region. As committed in the company's "Confidence in Motion" brand statement, FHI will continue to pursue further growth by offering its customers Subaru's distinctive "Enjoyment and Peace of Mind" driving experience.